The Evergreen school district selected a suite of online learning solutions from Fuel Education that delivered the targeted and diverse curriculum, technology tools, and services to support the district’s ambitious community-wide education programs. 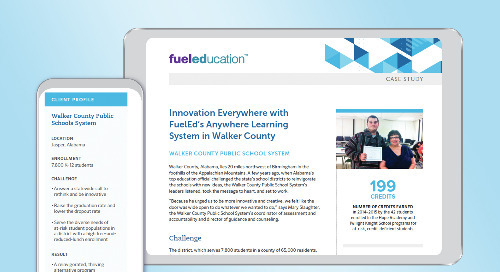 "FuelEd provides the platform where we can create multiple and different types of blended learning experiences—all under one roof.” says Ted Feller, Executive Director of Secondary Education. More than 2,000 students are now engaged in online learning throughout the district. View our video Personalized Learning for Students with Diverse Needs to see blended learning in action in Evergreen Public Schools.